Bodhgaya, Bihar, India – Soon after His Holiness the Dalai Lama had taken his seat on the stage this morning at the Central Institute for Higher Tibetan Studies (CIHTS), the students sang the Institute’s anthem. His Holiness was then joined by the Vice-Chancellor Geshe Ngawang Samten, the Ganden Tripa, Thrangu Rinpoche, Sikyong Lobsang Sangay, and Speaker of the Tibetan Parliament in exile, Khenpo Sonam Tenpel in lighting a series of lamps. A group of monk students recited verses of auspiciousness in Tibetan. They were followed by a group of women students who chanted the same in Sanskrit. Vice-Chancellor Geshe Ngawang Samten began his welcome address by paying his respects to His Holiness and other dignitaries among the guests. 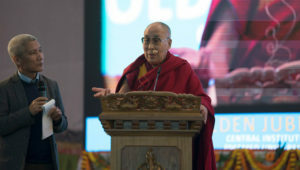 He recalled that in 1959 His Holiness and about 80,000 Tibetans arrived in India as Tibetan religion and culture came under attack in their homeland. As a result of His Holiness’s far-sighted vision, schools were established to educate children and settlements were set up so groups of Tibetans could preserve their identity. The Government of India provided fulsome support. In due course, Prime Minister Jawarhalal Nehru also lent his support to the founding of an Institute of Higher Education, which was launched in affiliation with the Sampurnanand Sanskrit University in 1968. Zong Rinpoche served as Principal for the first three years and he was followed by Samdhong Rinpoche, who served for 30 years. Renowned scholars, such as Pt Upadhyaya and Smt Kapila Vatsyayan contributed to the development of the Institute. The intention was to produce students who were wise, skilled and also kind, motivated to contribute to society. They were encouraged to aim high. Another early purpose of the Institute was the restoration in Sanskrit and translation into Hindi of classic texts that had been translated into Tibetan. So far about 80 such texts have been completed. Another 100 or so have been translated from Sanskrit into Hindi and English. There have also been efforts to revive the Indian tradition of debating different philosophical points of view. Results of research into the Tibetan medical tradition have been encouraging. A centre has been opened to focus on the study and history of Tibetan literature. In addition a substantial project is envisaged with the Government of Bihar to translate the entire collection of texts that Rahul Sankrityayan brought out of Tibet. A Summer School has been established to enable students to extend their experience. Plans are afoot to set up branches of the Institute in different parts of India. Related to this are plans to extend teacher training. The Vice-Chancellor expressed deep thanks and appreciation to His Holiness for giving so many people hope. He also expressed gratitude to the Government of India for its consistent support over the last 50 years. He concluded his speech with the information that the Minister of Culture, who is also the Chancellor, and the Additional Secretary, Ministry of Culture, had been prevented from attending the ceremony because of delayed flights. His Holiness released first the Golden Jubilee Souvenir book and then a shelf-full of the Institute’s other publications. The Institute offered symbols of gratitude to His Holiness, the Government of India, the Ministry of Culture, and the Kashag, as well as to Ven Samdhong Rinpoche and Dr Smt Kapila Vatsyayan. Alumni of the Institute then offered symbols of gratitude to His Holiness, the Government of India, Prof Samdhong Rinpoche and Dr Smt Kapila Vatsyayan, as well as an array of retired teachers. The Minister of Culture’s message was read by Prof Deo Raj Singh, following which Speaker of the Assembly of Tibetan People’s Deputies, Khenpo Sonam Tenphel addressed the gathering in Tibetan. Sikyong Dr Lobsang Sangay congratulated CIHTS on its 50th anniversary on behalf of the CTA. He lauded the former teachers for their contribution to the Institute’s development and complimented the Vice-Chancellor for his leadership. 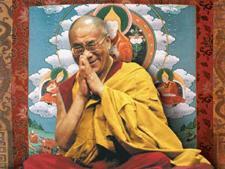 He praised Ven Samdhong Rinpoche for the 30 years of his life he dedicated to the Institute. As to the future, he encouraged students and teachers to heed His Holiness’s example in promoting human values and inter-religious harmony, seeking to keep Tibetan language, religion and culture alive, while speaking up for the protection of Tibet’s natural environment, and lastly the reviving of ancient Indian knowledge here in India. The Sikyong mentioned that after the occupation of Tibet, the Communist Chinese attempted to eliminate Tibetan religion and culture by disrobing monks and nuns and destroying monasteries. They thought they had succeeded, but they had underestimated His Holiness efforts to re-establish the Nalanda Tradition among Tibetans, the peoples of the Himalayan region and even among Chinese Buddhists. He prayed that His Holiness live very long, that the Tibetan people’s wishes be fulfilled and that the day of His Holiness’s return to Tibet comes soon. Former Governor of Sikkim, Dr BP Singh, recalled with nostalgia the period of his personal association with the Institute in the 1990s. He commended the two qualities that the Institute encourages students to aspire to—a simple life and high thinking. When His Holiness was finally invited to speak, he preferred not to use his ‘broken English’, but to employ the beautiful dialect of Central Tibet. He called on Dr Thupten Jinpa to translate for him. “Today happens to be the first day of 2018 and although the date is only a human convention, it prompts us to think about how we use our time. We should approach the New Year in a fresh spirit, not just carrying on as before. We should change. A new year offers a new opportunity. Recognising this is something only human beings can do, because of our intelligence. We need to come up with a fresh response to changing times. “Another important point, since this is a centre of learning, is to take the opportunity to shake up our brains without getting fixated on a single point of view. We must take different angles into account. We need to combine the skilful means of intelligence with the warm heart of compassion. “The previous speakers have expressed themselves eloquently so there is little for me to add. And although I’m physically here, my mind is already in Bodhgaya. However, I am prompted to tell you a story I was reminded of this morning. “In 1956, the Chinese Communist Party set up a Preparatory Committee. Its members visited various villages where the inhabitants observed that they had to learn to clap at specific points. Today, we’ve had to clap a lot too. In the past in Tibet, we clapped to dispel negative forces. I remember that when a small group of Germans visited Lhasa, local people were so disconcerted to have these alien people in their midst that they clapped their hands—the Germans thought they were being greeted and applauded. “I don’t have much to say. We are all travelling through time with its years, months and days. But when you look back from this point at the beginning of 2019 will you do so with a sense that you used the year well? Or will you have a sense of regret? Better to prepare to use the year in a meaningful way so that when you look back on it, it will be without regret but with satisfaction. Make a determination to live a good life—the ripple effect will spread out from you through your family, your community and your country. This is how real positive change takes place, a transformation that starts within spreads outwards. Thank you.” The Registrar, Dr RK Upadhyay brought the celebrations to a conclusion by offering thanks to His Holiness and other dignitaries for attending. He described the celebrations as an auspicious occasion and harked back 50 years to His Holiness’s original vision. He suggested that in trying to fulfil it and spread His Holiness’s message of peace and compassion, there is hope for the world. His Holiness had planned to fly from Varanasi to Gaya, but low visibility due to foggy conditions meant in the end that he had to drive instead. He arrived in Bodhgaya after dark where hundreds of people gathered to greet him and retired immediately.